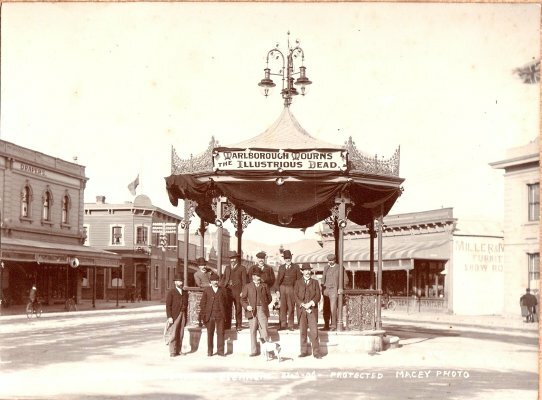 Description A black and white mounted photograph showing a decorated Cleghorn Memorial Rotunda in Blenheim's Market Square (or Place) in June 1906 for the funeral of Prime Minister Richard John Seddon. Written on the bottom of the photograph is, "Seddon Funeral Memorial Blenheim 21-6-06 [21 June 1906] - protected Macey Photo[graph] No [number] 4." A banner draped on the Cleghorn Rotunda roof reads, "Marlborough Mourns the Illustrious Dead" and there are black drapes on all sides of the rotunda. A group of well-dressed men, one with a stick under his arm and a small dog at his feet, stand facing the camera. The Post Office building is just visible on the right. Miller & [obscured] Furnit[ure] Show Ro[om] is written on the building to the left of it. The Drapers building on the left is F. Watson and Company and the hotel beyond it is the Masonic. Written on the back of the photograph by Norm Brayshaw: Back row left to right, G.H. Mogridge; F. Bircher; D.P. Sinclair; J.J. White, John Brown. Front row left to right, R.H.W.D. Dunn; Geo. Patchett; Arthur Wiffen; Pearce (manager of gas works). Right Honourable Richard John Seddon was Prime Minister of New Zealand from 1 May 1893 to 10 June 1906 (Milestones - Turning Points in New Zealand History, Tom Brooking, Mills Publications Ltd, 1988, page 200). NOTE: This photograph is NOT the one used on page 30 in the book, "Click - A Captured Moment. Marlborough's Early Heritage", Published by Marlborough Historical Society 2005, Editor and compiling by Lloyd Kerr.